THIS IS IT! THE BATLE ROYALE OF YOUR DREAMS–THE ASTONISHING AVENGERS VS THE UNCANNY X-MEN FOR THE FATE OF NEW YORK! The villains battle the X-men . Deadpool tries to bring Evan to the fore in Apocalypse to no avail. Elsewhere the Scarlet Witch casta a spell that reveals that Magneto is not her and Quicksilver’s father. Before she can kill Doom he escapes. The inverted Avengers meet up to discuss what will be doen about the villains and the X-men. The X-men stand triumphant and the gene bomb reaches zero. 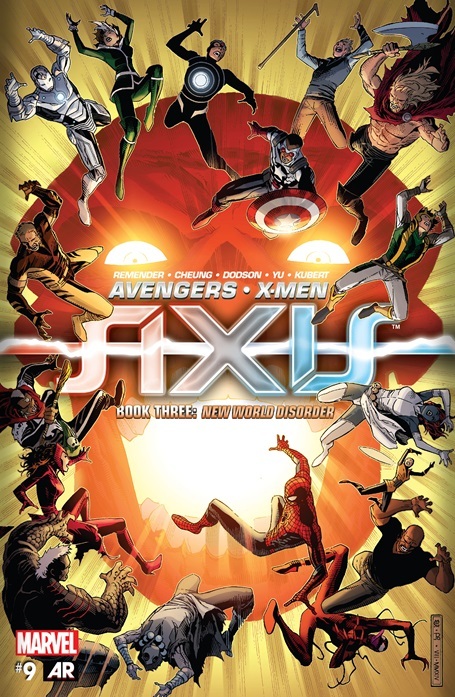 I liked the cover with the AXIS logo splashed across the middle of the book. I particularly liked the half which showed Deadpool in his tao/Buddhist garb facing off with Apocalypse with a kitten hopping over lava below. This was also an action heavy issue which I’m sure some will like. The battles themselves though pale in comparison to what took place in AVX. ACT III: NEW WORLD DISORDER THIS IS IT! THE BATLE ROYALE OF YOUR DREAMS–THE ASTONISHING AVENGERS VS THE UNCANNY X-MEN FOR THE FATE OF NEW YORK! The ending from last issue gets completely negated by Caranage smothering the bomb with his body and seemingly dieing in the process. The Avengers and X-men engage in battle. Nomad and Steve Rogers watch from elsewhere and make plans to secure the Red Skull. In Latveria the Scarlet Witch is still on a rampage Dr. Doom makes his retun with DOCTOR VOODOO and DANIEL DRUMM! They quickly dispatch the witch and take control of her. On the battlefield Steve Rogers in battle armor escorting the skull out of the X-men’s clutches. AXIS is a huge disappointment on almost every conceivable level. This issue was big on the action and light on character development. There are a few moments clearly meant to be “cool” but I’m so disengaged from the whole thing I find it all lacklustre. Thor and his age get the lion’s share of cool moments and everyone else is just fodder. On the up side though we got a cool cover and some of the best art this series has seen yet. The saving grace of this issue was the return of Doctor Voodoo and Daniel Drumm after the later sought revenge on the Avengers after the first saved the world in a heroic blaze of glory. Having the drums back made this cringe worthy tale mildly bearable. Who will live? Who will die? Who will remain inverted? A shocking climax that promises to crack the Marvel Universe to its very core! An old foe must claim the mantle of his greatest enemy to save the lives of all he cares for! An X-Man’s horrifying fate! An Avenger’s appalling choice! If you read only one comic this century – This is it! All New Captain America battles the old Steve Rogers in armor while the Avengers and X-men who were inverted try to kill each other. 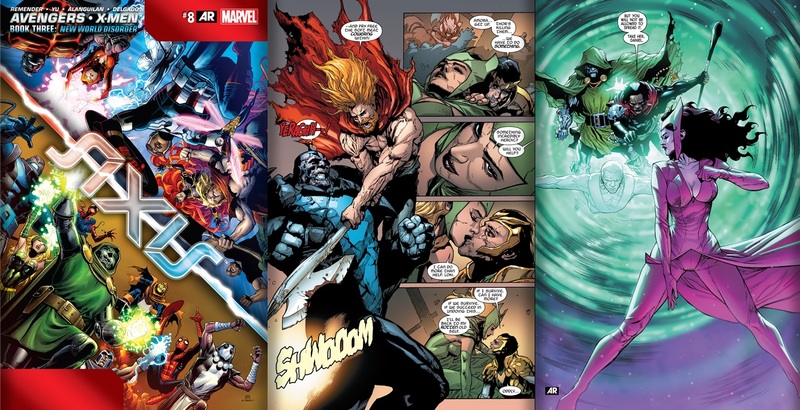 Sabertooth and Mystique shows kindling of feelings for each other, Thor and Loki face off on the moon with Loki managing to lift Thor’s Hammer. 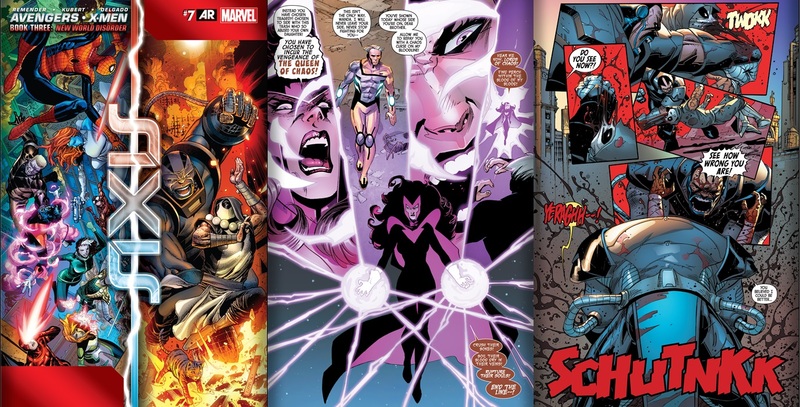 Jericho Drumm controlling the Scarlet witch alongside Doom and Red Skull reverse the inversion process but Tony Stark blocks the effects on himself Sabertooth and Havok. With most back to normal the inverted flee leaving Creed. In the aftermath Creed goes to Jail to pay for his crimes, Havok joins up with his brother Cyclops and Stark continues to party. A new Avengers Unity squad is formed and life goes on. ← Mike Colter is the Netflix Luke Cage!